Chris Shiflett has revealed that he’ll release his solo album Hard Lessons on June 21 via East Beach Records & Tapes/Thirty Tigers. The Foo Fighters guitarist previously shared the track This ‘Ol World, and today he’s followed that with the new single Welcome To Your First Heartache, which can be listened to below. 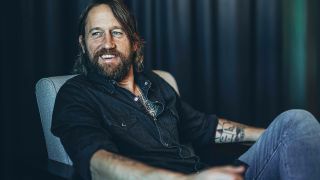 Shiflett recored the album at Nashville’s RCA Studio A, and he’s joined on the record by fellow guitarist Cobb, drummer Chris Powell, bassist Brian Allen, keyboardist Michael Webb, Paul Franklin on pedal steel and Kristen Rogers on harmony vocals. Hard Lessons also features a duet with Elizabeth Cook on The One You Go Home To and special guest guitarist Laur ‘Little Joe’ Joamets on This Ol’ World. Shiflett says: “I remember one night between Foo Fighters gigs last year I went out for dinner with Dave Cobb to chit chat about making this record. He said he had a vision of me playing through an old Marshall JCM-800. So, when it came time to record, we found one, cranked it up and it was perfect. “I think this record hits a little closer to mixing everywhere I’ve been musically into one big blender and comes out something a little different." Pre-order details will be released in due course, but the cover art and tracklist can be found below. Shiflett will head out on tour later this month in support of the record.